“Cholesterol.” You’ve heard about cholesterol. You’ve seen and heard a number of commercials about it, we’re sure – perhaps you’ve even seen it mentioned on a cereal box or two. But while the word “cholesterol” can be seen and is heard often when talking about good health, a number of myths about it tend to get in the way of efforts to properly address cholesterol-related needs and issues. Fortunately for us, September is National Cholesterol Education Month – meaning that now is the perfect time for our staff to help you learn about cholesterol, get your blood cholesterol checked, and even take steps to lower it if it is high. Keep reading to learn how you can get started and do just that. The first thing to understand about cholesterol is that by itself, cholesterol is not a bad thing. In fact, cholesterol is an essential fat that the human body needs to function. Unfortunately, due to a number of factors, cholesterol can sometimes collect in our bloodstream and build up on the walls of our arteries; this build up can then harden our blood vessels, and even create blockages over time. This phenomenon is why people are at risk of suffering from heart disease, a heart attack or stroke when they live with high cholesterol. 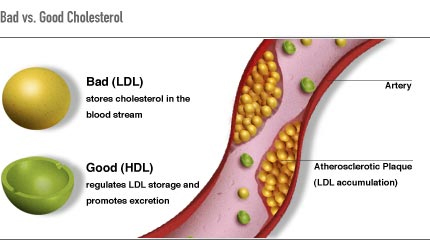 Another thing to remember about cholesterol is that there are two types of cholesterol: high-density lipoprotein (HDL) and low-density lipoprotein (LDL). LDL cholesterol is often referred to as “bad” cholesterol; in fact, whenever experts talk about living with high cholesterol, or about combating the effects that cholesterol has on the heart or circulatory system, they are referring to LDL cholesterol. HDL cholesterol, on the other hand is often referred to as “good” cholesterol, as it actually works to keep our blood vessels healthy, and can even combat the effects of the other type of cholesterol. Remember, there is no way to completely eliminate cholesterol from your body; in fact, doing so would be extremely harmful. What matters is maintaining a healthy ratio between your HDL and LDL levels; doing this will allow your body to function properly, and will help to keep your heart safe. Unfortunately, many people in America are currently living with high cholesterol, or elevated and unhealthy LDL cholesterol levels. According to the C.D.C., more than 102 million Americans over the age of 20 currently have high cholesterol. Even worse, less than half (48.1%) of adults with high LDL cholesterol are getting treatment to lower their levels. One possible reason for this statistic is that high cholesterol has no outward symptoms - there are no signs telling people that they need to visit with their doctor to look for a problem. Unfortunately, this lack of symptoms often masks the problem in many people – and in many age groups, since high cholesterol can affect children, teenagers, adults and senior citizens alike. As a result, many people do not know they have high cholesterol until they experience cardiac problems related to it. While high cholesterol levels are a serious health risk, the good news is that it’s very easy to determine if it’s a risk you personally should address: a simple blood test is all that’s needed to check your cholesterol levels. If the tests reveal that your levels do not fall within what’s recommended, you will need to begin working with your doctors to take steps to control it. In many cases, a few lifestyle changes go a long way in reducing or controlling cholesterol; if these changes are not enough, your doctor will likely prescribe a medication to help control it. Eat a healthy diet that is low in saturated fats and trans fats. Polyunsaturated fats, on the other hand, are recommended, as they may lower blood cholesterol levels. Eating high-fiber produce is also an important part of this type of healthy diet. Exercise regularly to help control your cholesterol. Try to engage in moderate-intensity exercise for 2 hours and 30 minutes every week (that’s just 30 minutes of exercise five days a week). Maintain a healthy weight, as being overweight or obese can raise your cholesterol levels. Losing weight, on the other hand, can help lower your cholesterol! Quit smoking. While smoking alone has no impact on cholesterol, it will only enhance the damage that LDL cholesterol can do – so the sooner you stop, the better! While talking about cholesterol can be scary, the most important thing to remember when dealing with this matter is to not panic. As we hope we’ve shown, there are plenty of things that can be done to address cholesterol issues! Additionally, if you have concerns about your cholesterol, we strongly encourage you to visit with your doctor so that you can form a plan together that will address your health needs in a safe and responsible way. If you’re ready to start this journey, just give your local practice a call and let us know!